Modern connectivity applied to karaoke. HDK Box is a Karaoke system with extreme intelligence. 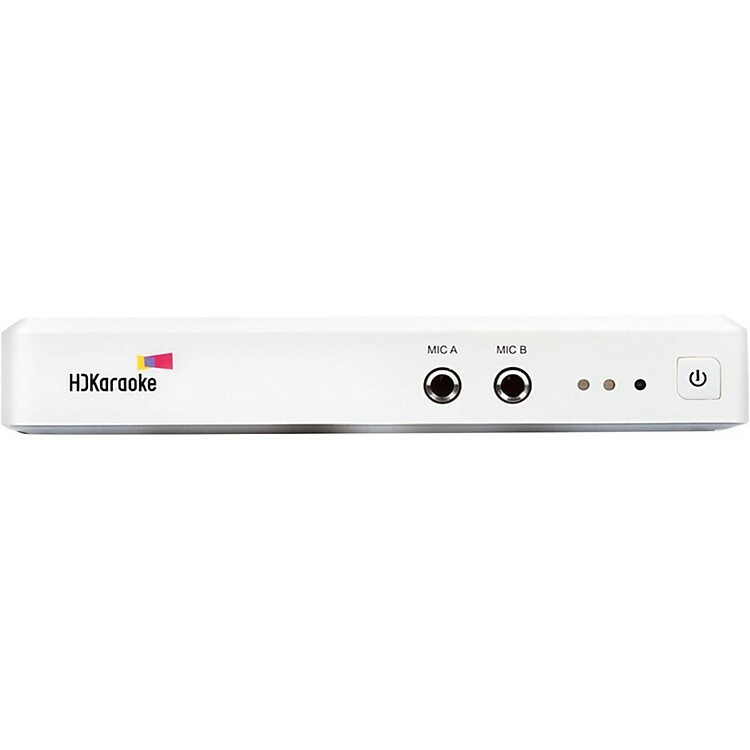 By integrating advanced internet multimedia technologies, the HDK Box can bring the latest Karaoke content directly to your home for you to enjoy on your TV or with your tablet and mobile phone. HDK Box incorporates the powerful Sigma Design processor, offers full support for Ethernet (LAN), wireless networks (Wi-Fi) connections, 1080p Full HD video output, iPhone/iPad/Android control applications and a variety of media formats. Its high-quality, slim, lightweight body allows users to sing and share a new entertaining experience with their friends and family anytime, anywhere. HDKaraoke is one of the first companies to offer you an iPhone/iPad/Android app so you can use your smart phones and tablets to control the selection of songs and all other operations. There is no longer any need to use a remote and a songbook or an additional touch screen to make singing karaoke so much fun. HDK Box supports Ethernet (LAN) and wireless networks (Wi-Fi) connections allowing the system to automatically update songs weekly. Manually adding songs is no longer necessary. Keep up with the all the latest new releases. HDKaraoke receives support from American Service providers and Asian major and independent record companies and provides licensed digital music and video content. It features a very large karaoke music content portal in North America to provide over 9,000 English karaoke videos as well as many thousands of karaoke videos (Chinese, Taiwanese, Cantonese, Vietnamese and Filipino) to the Asian market. *English karaoke videos are continuously being rendered into HD quality. In total, 15,000 songs will be gradually added into the library. HDK Box 2.0 now offers MP3+G files playback from external USB storage. User can even use the “HDKaraoke Control App” to wirelessly search and select your favorite MP3+G files saved in USB drive from your iPad, iPhone and Android devices. HDK Box 2.0 newly added recording feature allows you to record your own singing. You can choose to save your singing to your USB storage, or with just one click of a button instantly share your singing to social sites such as Facebook and Twitter, where your friends and family can listen to your master piece. The high-performance Sigma Design configuring decoder chip supports HD 1080P HDMI Full HD output, YAMAHA professional karaoke mixing chip supports vocal mixing and a wide range of video encoding methods, to make your home a real home-concert theater. HDK Box's innovative design redefines karaoke, breaking away from traditional karaoke. HDK Box is ultra-compact and portable. Only 8.0" x 4.7" x 1.3", and weighing just 2.1lb, makes it easy to use at home or take it to a friend's house party. HDK Box has online streaming technology and a large capacity built-in hard drive. When you choose a song for the first time, it will automatically online stream to play and synchronize download to your HDK Box built-in hard drive. Next time when you choose the same song, it will play locally. You can add and delete songs anytime you want. With these flexible features, you never have to worry about a full hard drive. Streaming service requires a subscription that's paid separately. HDKaraoke App supports the multiple devices simultaneously. You don't need to wait for a long time to choose a song. Just touch your smart device, select your songs whenever and wherever you want. HDK Box has "Song Request" function. If you search a song and cannot find it, HDKaraoke App will automatically prompt the screen "Song Request". You can click "request" button to submit application. Users can also visit our website to fill out the "Request song" form. We will promptly upload the requested song to HDK Box service portal. Subscription service gives you unlimited access to the English library. Internet connection is required for the online subscription service. For A La Carte downloads, users own those downloads, and may play downloaded songs "without internet connection". Order soon for the easiest, best-sounding, best-looking karaoke experience around. Operating Temperature : 0 35 ?